Ennis Fabrics' has a diverse specialty market, which includes providing fabrics, supplies and flooring for industrial, marine, awning and transportation markets. Our products meet the highest standards for use in diverse applications. 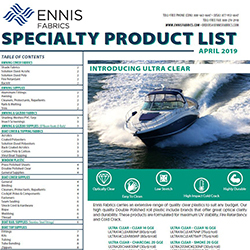 Ennis Fabrics has an extensive range of products that are suitable and utilized in the marine market. We have fabrics to cover boat interiors, outdoor boat seats, boat flooring for both indoor and outdoor as well as fabric that can be used as wall coverings. Boats can be a hobby, a lifestyle or a living. Regardless of how boats fit into your life, they are worth looking after and finishing with the right, high-quality fabrics. Also, keep in mind that due to the water-resistant, quick drying nature of our marine products the application of these fabrics goes far beyond just boats. The structure of an awning is important, yet what customers remark on and what is most impactful is the fabric used. Ennis Fabrics understands the importance of having an awning fabric that looks great and is highly functional. We have worked hard to develop fabrics that won't let the rain seep through, are cost-effective, whilst provding a range of styles and colors to choose from. We offer an extensive range of cross-functional products that would work well as awning fabrics, however one of our most popular awning specific fabrics is Ennis 1974. Ennis Fabrics' offers a wide selection of fabrics for industrial use in any market. Our Marine, Awning and Industrial products are manufactured to ensure high-quality. Not only are our products durable and cost-effective they are also multi-functional. One person may use our Coated PVC Mercury as a truck tarp, another person as a playschool easy-to-clean floor cover and someone else as the interior fabric in a hockey bag. See, same product yet very diverse uses.